The IPI is a composite index consisting of six components: judicial independence, administrative burden, trade openness, budget transparency, e-citizenship and freedom of the press. It aims to give an objective and comprehensive picture of the state of control of corruption in 109 countries. Below you will find an outline of the methodology behind the IPI. A more extensive explanation of the methodology and the composition of the IPI can be found in a working paper, published by the European Research Centre for Anti-Corruption and State-Building. How Were the IPI Components Selected? The six components of the IPI were selected based on years of theoretical and empirical research on the control of corruption. They are nested in the theoretical framework proposed by Alina Mungiu-Pippidi and her team at the European Research Centre for Anti-Corruption and State-Building (ERCAS). The components adumbrate the idea that corruption reflects a national-level equilibrium between resources and constraints. Based on previous research, components were selected which reflect that theoretical framework and which are significantly associated with most common measurements of control of corruption. Tests also took into account differences in the levels of socio-economic development across countries by controlling for the Human Development Index (HDI). See the results here. In the process, particular attention was paid to choosing components which are also objective and actionable and thus can help in the design of evidence-based reform strategies. How Were the Components Constructed? Two of the components (judicial independence, freedom of the press) rely on a single data source. Those components were standardized by constructing the so-called z-score of the variable in order to equalize their mean values and standard deviations. The other four components are based on several data sources. For those, standardization was first applied to each sub-component, before using the simple mean of the sub-component z-scores in order to derive the final component. Every final component score was then normalized to range between 1 and 10 using a min-max-transformation with higher values representing better performance in this issue area. The overall IPI was finally derived by the equally weighted average of all components. The component on the administrative burden, for instance, consists of a mean of the z-scores of the number of procedures and the time to start a business for both men and women and as well as the number and time burden associated with paying corporate tax. Following standardization and normalization, a higher value represents a better score for administrative burden. The maximum value of 10 thus reflects the lowest degree of bureaucratic regulations in the country sample. The standardization procedure ensures that the IPI does not depend strongly on the component with the greatest dispersion. A country can score badly for one component, but still do well on the overall IPI. Such a situation would reflect overall a good level of control of corruption in the country, with scope for improvement in one reform area. The research team also used a principal component analysis to aggregate the components. This variable correlated with the IPI at the value of 99%. For the sake of simplicity, transparency and, especially, better intuitive explanation, the team therefore decided to use the simple aggregation to build the IPI. How is the IPI Validated? The IPI strongly correlates with the most common corruption measurements. It explains approximately 75% of the variation of the control of corruption in 105 countries. 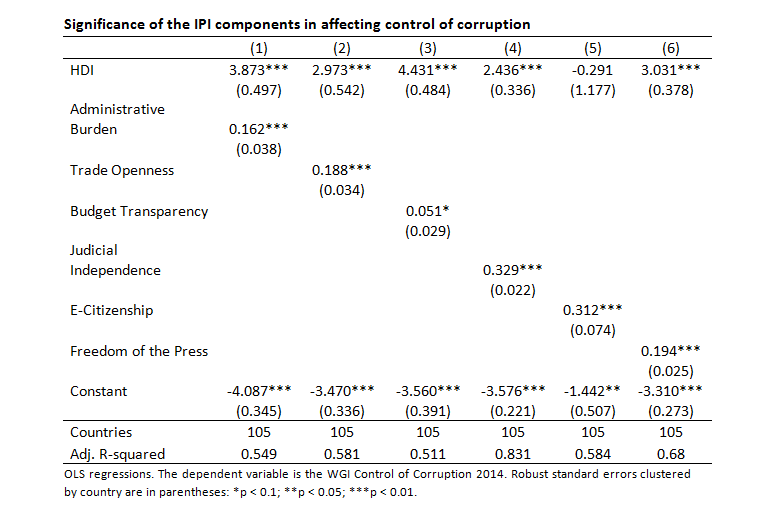 The IPI can thus serve as an instrument to explain variations in corruption levels. Due to the nature of its components it gives a more objective view of the societal framework for the control of corruption. The components are aimed to be actionable so they can serve as an evidence base for reform strategies. What changed between the first and second editions? With its 2017 edition, the IPI saw a few significant changes between its first edition and second edition. First, five new countries have been added to both editions of the IPI. Additionally, Yemen was removed from the dataset due to data incompleteness as a result of the other major change: the World Bank significantly changed its methodology for calculating trade openness in 2017. Previously, the IPI’s trade openness component was calculated from the average number of documents required to export and import goods, as well as the average of the time required to export and import. The 2017 trade openness statistics from the World Bank changed their methodology, however, so that the old indicators are not available for the 2017 data and similar, but distinct, indicators are now being used in their place (see below for clarification as to what measurements are now being used to calculate the trade openness component). This change in methodology means that with this new IPI edition, both the 2015 and the 2017 values have been updated. Changing the previously-published data to match the new methodology was essential to ensure that the two editions remain comparable to each other. Where Do the Components Come From? Based on the “judicial independence” indicator from the Executive Opinion Survey of the World Economic Forum Global Competitiveness Dataset. This indicator asks the question “To what extent is the judiciary in your country independent from influences of members of government, citizens, or firms? [1 = heavily influenced; 7 = entirely independent]. The indicator has been standardized and transformed to be in range between 1 and 10 with 10 implying the highest judicial independence. The data by country can be found here. The indicators are taken from the World Bank Doing Business Data. This mean value has been transformed to be in range between 1 and 10 with 10 implying the lowest administrative burden. The indicators stem from the World Bank Doing Business Data. Their value has been transformed to be in range between 1 and 10 with 10 implying the highest trade openness. Budget Transparency Simple mean value of the scores resulting from 14 specific questions from the Open Budget Survey that cover transparency of the Executive’s Budget Proposal. More information on questions and respective scores is presented in the full dataset. The data are to a large extent provided by the International Budget Partnership and in some cases reliance is placed on own data (these cases are noted with an asterisk in the spreadsheet provided below). Currently, the same data is used for both IPI editions as a new version has not yet been released. The value has been standardized and transformed to be in range between 1 and 10 with 10 implying the highest budget transparency. The first two variables were taken from International Telecommunication Union’s ICT Dataset; the latter is from the Internet World Stats. The value has been transformed to be in the range between 1 and 10 with 10 implying the highest score for E-Citizenship. Freedom of the Press The score stems from the Freedom House Freedom of the Press Report. Values have been standardized and transformed to be in range between 1 and 10 with 10 implying the highest freedom of the press.